I'm brand new to this forum because I just found out about it from a friend and fellow Avengers fan. I'm glad to know that there are still forums dedicated to the program. These days, one searches for "the Avengers" and is more likely to have their screen filled with links to a certain Marvel comic series or series of films. It was partly that that made me want to bring more attention to the sixties British television version. So, I did what many people might do. I wrote a book about the show. Years ago, I ran a website called The Quite Quite Fantastic Avengers Website Ltd, which was named after the organization run by Ron Moody in "Honey for the Prince". And I decided to take all the material I had written for the website and edit it into a book. In the end, I discovered that the original writing really wasn't up to standard, so I rewrote everything. Six months later, the end result is a 209,000 word book with 427 pages at a 8.5" x 11" trim size. Boy, was I silly! Anyway, the book is called Quite Quite Fantastic! The Avengers for Modern Viewers. It's my attempt to bring newfound attention to the series and look at it from the viewpoint of today's television viewers. Both The Avengers and The New Avengers are covered in full, and it's intended to be largely comprehensive. The bulk of it is composed of reviews and analysis, but there is considerable information on production behind the scenes for each season and a series of mini-biographies of all the main stars, and many of the guest actors, directors, and screenwriters. I also review related media, like the 1998 film and some of the independent productions starring Diana Rigg. I realized at some point during the process that I was writing the Avengers book that I would like to read, and I hope that you will find it highly enjoyable. Naturally, I'm here in part to promote my labor of love, but I look forward to discussing the series with all of you here. In the meantime, here are the links to the books on Lulu. I hope you'll consider reading my work. Good to see you here, Michael! I'm sure that some forum members will member your QQF website very fondly, as I do. Your past creative work in Avengers fandom certainly stands you in good stead for writing this book. Having discussed the book with you for some months I'm sure it will be a valuable addition to the bookshelves and reading lists of all enquiring Avengers fans. I hope it does well for you and I look forward to reading and reviewing the book when my copy arrives. Thanks Alan! I certainly hope you enjoy it as much as I've enjoyed Two Against the Underworld! When I first saw a new member on this forum with a nickname QuiteQuiteFantastic, I immediately remembered about the legendary website of Mike. I thought that nickname was just a coincidence, and now I find out such a double surprise. A double surprise, because, in the first place, the appearance of Michael in this forum is already a big event and personally evokes nostalgia for those times when the first years I wandered around the international Avengerland and loved the site Quite Quite Fantastic Avengers very much. Secondly, the release of another detailed book about favorite TV series, this time from Michael Scott Phillips. I looked at book through Lulu and read the preview - I definitely will buy it. What I liked - it's completely written in the style of Mike in the way that you can remember on his wonderful site. Detailed, voluminous, interesting material (based on preview, of course), and no less important - written by a man who has a lot of experience in it. Many Thanks Michael for your wonderful work in the form of this book. Although many of us know that there exists an Internet Archive as Wayback Machine that stores many pages of now closed sites, I noticed through the years that some pages and even websites start to disappear without a trace there. This can be due to different grades of malfunctions that lead to data loss, or certain savings, etc. So there is no guarantee that any Avengers website that the resource has in storage now will be available on a permanent basis, so to speak. Moreover, I recall the periods when the author (s) of this Internet Archive referred to the fact that they needed finances to support this repository. With books - quite another matter. I think it was a wonderful idea for Mike to transfer the important content of his website to paper and bring a lot of new to the Avengers fans. Well, it's also valuable that it turns out that Alan not only knew about this book but also contributed to the project. Nice Bonus on "DVD disc". Wow -- you are so kind! That's very generous of you to say. You might be more than slightly overselling my talents but I appreciate it nevertheless. It has been quite a lot of work, and I'm excited to hear everyone's feedback in the coming months. I'm currently moving on to my second science-fiction novel, which is now in the backstory development stage. Yes, I reached out to Alan early on in the process to ask his permission to reference material in Two Against the Underworld. At the time, I was uncertain what I wanted to do about Season One since Quite Quite Fantastic! is primarily a book of reviews much like the website. Ultimately, I veered in the direction of a comprehensive resource, which seems wise in retrospect, and I re-reconstructed Season One. Two Against the Underworld easily remains the definitive resource on Season One however. Alan has been awesome, and I'm really grateful for all his help. He very much deserved a line in the acknowledgements. Also, I've noticed that the Lulu preview of the book cover looks quite hideous and doesn't represent the cover at all as it should be. So, I'm going to post a proper preview of the whole thing here, back and front, so everyone can see it. I remember this webside very well. I will put a message on the French forum for this new book. Congratulations ! Thanks Denis and Big Bear! I'm going to be promoting the book over the next few weeks, so I'm currently designing new graphics and whatnot. I was going to post the cover here but I've discovered that I'm locked out of my web domain. Some kind of SSL password thing. Bizarre but true. So, I have nowhere to host images right now. Anyway, I'll post the proper cover later. Also, if you guys want, nominate an episode or two here, and I'll post a sample from the book. Here is a better version of the updated cover for the paperback. The only difference with the hardcover is that some of the text moves to the flaps. Thanks for posting, cover looks good. Well done on the book. I remember the QQF website well, it was online when I became an Avengers fan, good times. In my opinion, nothing in the fourth season is without merit. It's my favorite season -- not an uncommon opinion, I know. Anyway, your wish is my command. I like this review, though it's somewhat shorter. And I gave the episode a C, which is to say rather middle-of-the-road. I do like it though! It’s tee time instead of tea time for The Avengers, and Patrick Allen doesn’t like golfers who play through. Instead, he kills anyone snooping around the thirteenth hole with a .303 Jungle Carbine stuffed into his caddy instead of a 4-iron. The gun even has its own head cover with a label. Such cheek! Thus, the pre-title sets up the story as it does in all good episodes of the series. Golf enthusiasts trade for spy secrets on the links. “The Thirteenth Hole” is somewhat of a break for the fourth season. It gives Steed and Emma a chance to relax, play a few rounds of golf, have drinks, play a few games of pick-up sticks in the clubhouse, and put away a few diabolical masterminds on the side. And that is just how the story plays out. The stakes are not particularly high and there is a casual feel throughout. This casualness is even betrayed in one nighttime fight scene between Emma and Collins, in which she almost becomes complacent, smirking at the ease with which she kicks him into a sand trap multiple times before he briefly gets the better of her and drags her in with him. Then, he is killed by a high-powered golf ball flying through. It leaves an imprint of its label on his head. Someone didn’t bother to call “fore!” Except it’s not a golfer with lousy aim, it’s a tank, or at least a golf cart tricked out with a golf ball bazooka on the back. Yes, an armed golf cart is roving the golf course at night killing club secretaries. Only in The Avengers. Patrick Macnee is especially good in this episode, and we need that because even Patrick Allen isn’t stepping up in particular. Again, Steed pushes his luck as he always does. With a superhuman burst of gentility he blatantly gives away all he knows about the villains’ scheme just to get a reaction, leaving them quite stunned and not knowing what to say. He also gets a chance to turn on the eccentric act at full force, incorporating all kinds of measurement devices into his golf game. He checks the wind and measures the incline on the vertical with a plumb line. You would think that Venus had to be in Leo before he could drive. Nevertheless, it could be said however that he’s a stellar golf player—with a little help from his adorable fairy godmother, Mrs. Peel. The golf match is played for all its silly potential, with every humorous cliché involving a sand pit or soft patch being played out by the end. Finally, when the villains get tired of all the fun and games, out comes the golf ball bazooka again, and Steed is knocked out. He recovers in the clubhouse while Emma absently flicks shillings into a bowl. Despite this brief lay about, our heroes manage to put away the vicious golf ball-firing crooks in an exciting and surprisingly serious fight scene at the end—within an underground bunker underneath the thirteenth hole. It’s serious, except for one thing—why do those scientists cringe when Steed throws a stick at the TV screen? They’re scientists and yet they don’t know that a stick can’t be thrown at them through a television screen? 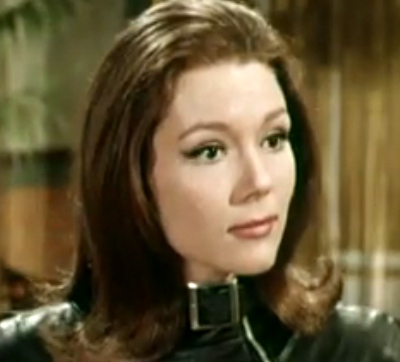 Having saved the Vostic 2 satellite and terrified Russian scientists on television as a finishing move, how do Steed and Mrs. Peel leave…? On a golf cart drinking champagne, of course! “The Thirteenth Hole” is a fun episode, if slightly slow-paced and inconsequential. It manages to make Steed and Emma look incredibly talented as they easily dispatch the enemy, but frankly, there’s something all too effortless about it to make it really interesting or exciting. The production of this episode also lets it down somewhat in the form of screamingly obvious rear-screen projection or optical printing for some of the closeup shots in the golf course scenes. This seems to be an unusual lapse for Roy Baker, who planned exterior shots at Mill Hill Golf Club in North London but was for reasons unknown forced to do them in studio. On the flip side, the nighttime golf course set is quite convincing. Excellent thanks for posting. I will be ordering a copy this week. I have had a self imposed 18 month break from The Avengers I was getting a bit tired of it and have been a fan since the 1983 channel 4 screening. I just needed a break. Tunnel of Fear and your book have got me excited again and im even hosting my own Cybernauts triple bill screening this summer! I went to order the Hardback, but it only ships from North America, with a very hefty postage charge to the UK. This is unusual for Lulu - any other hardback I've bought from them has been printed in Europe, with a domestic shipping cost. Any ideas why this should be the case for this particular book? I'm sorry about that. I believe that 8.5 x 11 hardcovers are only printed in the US. Other hardcover sizes may print in Europe. (It's something I need to research more as the information on Lulu is a tad confusing.) I didn't know until I had published the book that this was the case. I originally chose 8.5 x 11 for artwork that didn't end up happening, and frankly I'm kind of annoyed about the lack of European printing because obviously one of my biggest markets is Europe--the UK, France, Germany, Italy being major hotspots of Avengers fans. I've been considering reformatting the book into a 6 x 9 size that could be printed in France or the UK. I'll keep you posted. Having said all that, I personally think the hardcover is really beautiful, and it's worth it to get one. One such copy is heading over to the UK as we speak using regular snail mail, and as soon as it arrives I'll be able to report on the shipping speed and book condition. Edit: Also, may I inquire your country of residence? That way I can figure out which book size may reach the most customers. Thanks for the reply. Lulu hardbacks are very nice, and I always prefer them over paperbacks. I'm the the UK, by the way. I believe that in Europe Lulu prints their hardbacks in France, but only charge domestic shipping for them to reach the UK. I just got off the phone with Lulu. They informed me that the problem is that the 8.5 x 11 dust jacket hardcover is US shipping origin only but the casewrap hardcover is global (likely printing in France). Personally, I love the dust jacket version, but this is still great news for me because I can just redo the cover slightly and produce a 8.5 x 11 casewrap hardcover for my European customers without having to reformat the whole book in a different trim size. Not quite as nice as the dust jacket version but at least a little less expensive with all the shipping advantages. If you wish to wait until I can do that, I will understand. It may take a few days to prepare the new version but I will update everyone here when it is done. This reduces the shipping cost from £8.99 to free! And with the code FWD15, I saved another 15%. Result! Looking forward to reading it now. Of course, it will still be good to have a "Europe" edition, for those times when a free shipping voucher isn't available. Cool! I'm glad you found that. I'll have to make a note of that code for future reference. Please share your thoughts when you get the book. I have ordered the book today, with many thanks to James for the codes. looking forward to it. I am just curious looking at the cover, which shows Gambit on front cover and Tara on back cover. No criticism intended i assure you- just wondered if this is just a personal preference? I guess i 'm so used to the original series characters being the main focus on book covers etc that it raised an eyebrow! It was just for a second and returned to normal causing no lasting damage!! They are all Avengers after-all so it shouldn't matter. I'm just interested in these things...maybe too much time on my hands...? !